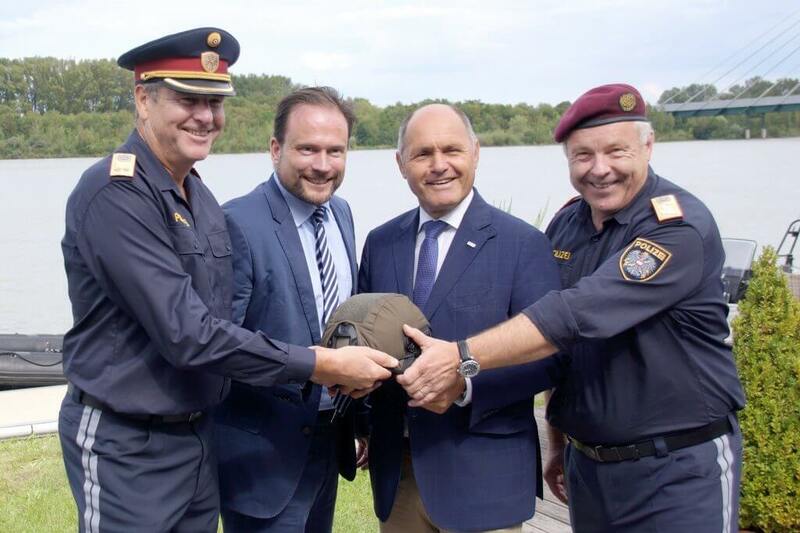 Together with Minister of the Interior Wolfgang Sobotka (Austrian People’s Party, second from right), Georg Scharpenack (third from right), Managing Director of ULBRICHTS Protection, handed over the new titanium helmets to the Austrian police. Schwanenstadt (Austria) / Vienna – The Austrian helmet manufacturer ULBRICHTS Protection is supplying 6.450 titanium helmets to the Austrian police. Patrol units will be allocated 6.000 helmets. Every patrol car at the Regional Police Directorates will be equipped with two protective helmets each. The new head protection is made of titanium and complements the existing ballistic body armour. The COBRA elite unit will receive the remaining 450 helmets. 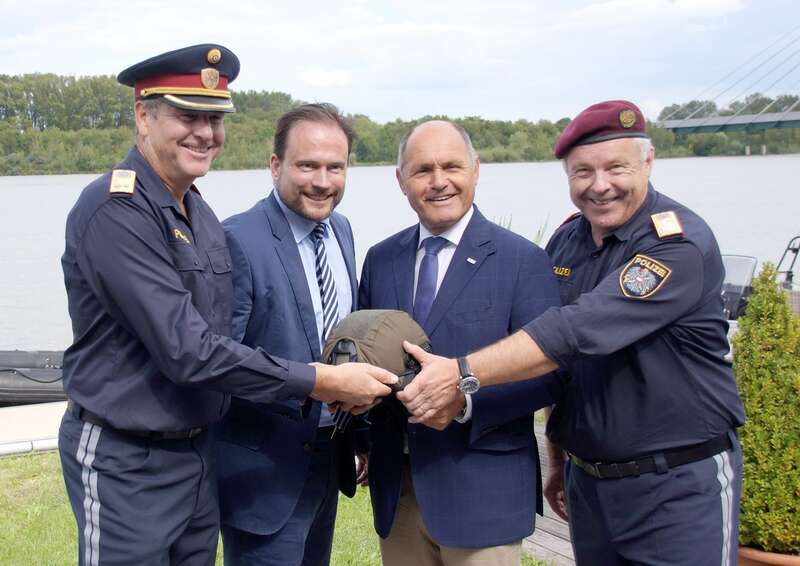 Yesterday, the new helmet was handed over to COBRA’s operational command by Austria’s Minister of the Interior Wolfgang Sobotka of the Austrian People’s Party and Foreign Minister Sebastian Kurz, also from the Austrian People’s Party. The handover took place at the Vienna Marina, where various European special forces had previously held a joint international anti-terrorism exercise. Forces from Germany also took part, including special forces from southern and northern Bavaria, as well as the German federal police unit GSG 9. In the training scenario, a cruise ship on the Danube had to be stormed from the air and the river and several hostages freed. The HOPLIT is a ballistic titanium helmet specially developed for police use. It provides effective protection against bullet fire, even near the rim of the helmet shell. In addition, it offers protection against explosions, bites, blows and chemicals. All components are also flame retardant. The inner helmet system can be adjusted precisely to the respective helmet wearer with just one touch by a knob on the outside. Due to the special requirements of the Austrian purchasers with regard to the titanium helmet’s protective effect, the helmets just handed over were delivered with an extra-large protective surface. Just how important a ballistic helmet can also be when on patrol was shown at the end of July during a shootout at a disco in Konstanz in Baden-Wuerttemberg in southern Germany. A policeman survived only thanks to his titanium helmet by ULBRICHTS Protection. Ballistic titanium helmets have been part of the equipment in Baden-Wuerttemberg since 2011. In this case, once again, two ballistic helmets were in the patrol car. In view of the new threats posed by international terrorism, 12 of the 16 German federal states have now opted to purchase ballistic helmets for their patrolmen. The Austrian expert for ballistic titanium helmets ULBRICHTS Protection has supplied about 90 percent of the new headgear. ULBRICHTS Protection from Schwanenstadt (Vöcklabruck district / Upper Austria), a division of ULBRICHTS Witwe GmbH, manufactures ballistic helmets made of titanium and titanium aramid (hybrid). The company’s international clientele includes special forces, police units and military personnel. ULBRICHTS Protection is one of the pioneers in the field of ballistic head protection. The company had already started producing steel ballistic helmets in the 1950s. Since the 1990s, the specialists have relied on the lightweight and high-quality material titanium. At the same time, they have specialised in ballistic protective helmets for police use. Decades of research and development, various patents and special manufacturing processes form the basis of the company’s innovative strength and make it the market leader in Central Europe. The titanium helmet series ZENTURIO and HOPLIT are considered state-of-the-art worldwide, as they offer proven and effective protection against bullet fire.